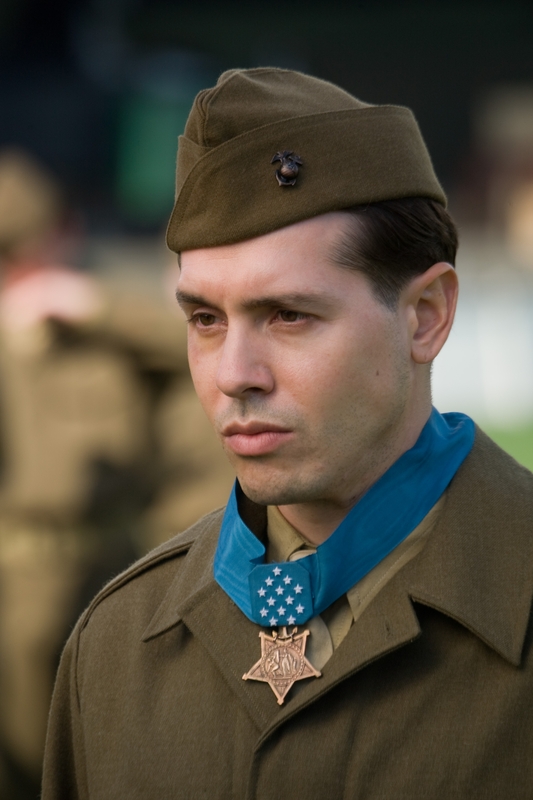 It’s fitting that the profile we’ve been working to do since March, on actor Jon Seda, was posted today, Memorial Day, on NewJerseyNewsroom.com. It was in March that we first made our request to HBO to talk to Seda, who portrayed World War II hero John Basilone in HBO’s miniseries “The Pacific.” In fact, we made the request before the episodes starting running. But Seda was busy working on a pilot, and then one scheduled interview got cancelled when one of Seda’s family members got sick. We finally spoke to him May 13. Anyone who reads this blog knows that it’s not just about home shopping. It’s about our passions, which include TV programming and, God help us, New Jersey. And both Basilone, who won the Congressional Medal of Honor for his heroics on Guadalcanal, and Seda are from New Jersey. Basilone hailed from Raritan, while Seda is from Clifton. Seda is also of Puerto Rican descent, like us. So we just had to write that story. When we asked HBO’s public relations exec to tell Seda to expect questions about Jersey, she said that wouldn’t be a problem, that he loves talking about his home state. And she was dead right. Seda, whose work we’ve enjoyed in shows like “Homicide: Life On The Street,” called from LA. He was down to earth, warm, and was in fact an enthusiastic fan of NJ. He even married a Jersey girl, someone from Passaic. We were especially interested in Seda because of his Clifton connection. Right out of Medill at Northwestern, our first job was at The Herald-News in Passaic. As it turns out, Seda told us he grew up right by The Herald-News building, a place we spent many hours in — and that his first job was as a delivery boy for the paper. The Cloud 9 bar right next to The Herald was the paper’s hangout, and we spent many an evening there doing shots of tequila and closing the place down. Seda’s favorite spot to eat in Clifton was The Hot Grille, a greasy spoon on Lexington Avenue that we’ve been to. We also learned that up until a few years ago, Seda lived in the town we reside in now, Montclair. He said he loved it there, but that he had to move his family to LA for his career. Seda said he felt a special affinity with Basilone. They were both from Jersey, and they were both boxers. Seda was good, training in the gym of comedian Lou Costello in Paterson, N.J., and of veteran boxing trainer Dominick Bufano in Jersey City. But his mom convinced to take acting lessons, and Seda’s teacher told him he had real talent. Basilone is a legendary figure for his part in repelling — with just a handful of men and several heavy machine guns — a wave of literally hundreds, if not 1,000, Japanese soldiers on Guadalcanal in 1942. He won the Congressional Medal for that, and was then called stateside to tour and sell war bonds. But Basilone wasn’t content to stay safe at home. Congressional Medal of Honor winners don’t go back to combat. But Basilone wanted to be back with his fellow Marines in the Pacific arena. He was killed during the Marine invasion of Iwo Jima. Some might call Basilone crazy for tempting fate and going back to the war, but Seda said he understood that. The actor still misses boxing, and could see how Basilone (who boxed while in the military) would want to go back. “I look at it like a boxer, who just can’t leave the fight when they feel they still have that fight in them,” Seda told me. Raritan hasn’t forgotten Basilone. Each September, it holds a Basilone memorial weekend, which includes a parade in his honor through town. 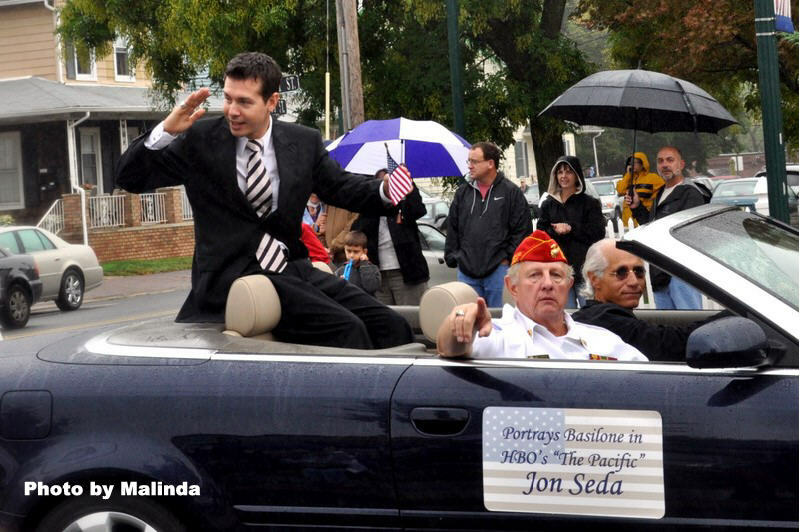 Seda came to Raritan last September to attend the event, and met many of the town folk. They loved him. So here’s to Basilone, and to all those who gave their lives for our country. You are currently browsing the archives for the Jon Seda category.